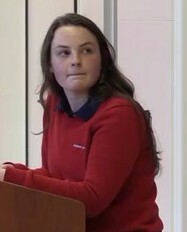 This Spring, our beloved Montrosian gave a powerful speech before the whole school. Her goal was to raise awareness about concussions. In the process of telling her story, our community had the opportunity to witness her courage, perseverance and magnanimity. It was a Common Homeroom presentation to remember. Sarah’s speech is reprinted with her permission. You can view Sarah’s full talk here. Good afternoon, my name is Sarah Lepsevich, and I am a Junior here at Montrose. Some may remember me when I joined Montrose in 9th grade; and, for those who don’t know me — because my high school time has been very segmented — let me share a little about my journey because the girl you see standing here today only resembles the girl I used to be. Being able to coordinate my body exactly the way I needed, came very natural to me: riding a bike, climbing trees, playing sports and activities were always easy for me to learn. I was the kid who immediately had to be active after sitting in school all day. I would spend hours outside until being called in for dinner. Then once I was able to join competitive teams, playing sports is what I lived for. My dedication on improving my skills and speed were not selfishly motivated, rather I always wanted to be better for my team. Becoming apart of the Montrose community in the fall of 2013 allowed me to continue to play the sports I loved while representing the school I was so excited to be a part of. During my freshman year I played for the Varsity Soccer and Lacrosse teams. You may have heard of the phrase Student Athlete. But, if I am being entirely honest with you, I was more of an Athlete Student! While I did okay in my classes, I didn’t give school work my first priority; I looked at my academics more of a means to an end. I did just enough to be able to play sports and keep my parents and teachers off my back. Beyond that, I met great friends and was having the time of my life acclimating to high school. I was truly happy! Then on September 10, 2014 — a perfect sunny day — life as I knew it would change. I was now a sophomore back playing varsity soccer. The sun was shining, the air was crisp and my grandparents came to support me, as they did so often. I took the field with my team; and, just after the start of the second half, a direct kick was called against Montrose on our end of the field. As a defender, I was accustomed to lining up on the wall: shoulder to shoulder with two of my teammates and watching the referee pace out 10 yards. However, this time would be extremely different …. this would be my last wall! As the opponent struck the ball, it shot up and connected directly with the right side of my head, between my eye and my ear; twisting my neck severely. Everything faded. The force of the ball knocked me hard to the ground, and I slammed the left side of my head on the turf, leaving my brain ping-ponging within my skull. The car ride home was torture. I lay across three seats, writhing with nausea, dizziness, and a headache. As an athlete, I had suffered concussions previously, I even suffered a serious concussion the fall of my freshman year during the last game of the season. I was acquainted with the protocols of complete brain rest, which meant no reading, TV or electronic devices for a period-of-time until I was symptom free. I stand here today embarrassed to say I was definitely one of those people who thought,“It’s just a concussion,” not realizing that a blow to the head can lead to a traumatic brain injury that causes brain dysfunction. After a few days the swelling and bruise no longer appeared on my face,; but, upon re-entry to school a week later I knew something was very different. Scared. I didn’t say anything. I attempted to return to my team a little over two weeks later. The first practice back, I was a completely different athlete. I could no longer dribble in-and-out of cones easily, I started toeing the ball and not keeping it within my control. I would even sometimes completely swing and miss the ball when trying to clear it. The rest of the season was very long and frustrating. My body was failing me, not doing what I knew it could do. No matter how hard I focused, I saw no improvement. I didn’t recognize the soccer player I had become — from a starter to spending the rest of the season on the bench. I honestly did not understand what was happening to me. Fear left me not wanting to be entirely honest about my symptoms; I knew if I were, I’d risk losing the ability to take any field again. I can appreciate now, how disturbing that may sound; however, back then my identity was based on being an athlete. The field is where I was most comfortable and confident. Ignorance had me attempt to power through the brain injury, but it did not take my parents long to figure out that I not only wasn’t improving, but I was slipping away entirely. Desperate to understand what was going on, my parents brought me back to my pediatrician who recommended extensive neurological testing, which identified that I was suffering from Post-Concussion Syndrome, a condition when your symptoms linger for several months after suffering a concussion. My personality changed with extremes ranging from irritability to excessively emotional. My grades dropped beyond anything I had every experienced, and the physical symptoms had taken over my life. To put things in perspective, let me share an example: When you stub your toe, you immediately snap and become irritable because instantly the pain signals your brain to let you know you are suffering. Well when you are suffering from a brain injury, any of these symptoms you see on the screen send the same signal to the brain; but the difference is you are experiencing all of these symptoms at any given moment. Your brain becomes so overstimulated that the snapping reaction is on a continuous loop. Your only recourse is to isolate yourself in a dark, quiet room; and, even then, only some of the symptoms are alleviated. By late spring, I was not improving. The Concussion Clinic, that had been monitoring me monthly, thought that I had suffered an eye injury which was preventing my recovery; but the exam was negative, and that Dr came to the conclusion that there was nothing wrong with me — and that I should just push through the “symptoms” to try and get back to my normal self. Less than a week after that visit, I had my permit and was driving with my mom in an attempt to get back to normal, you know … as the Dr ordered — when my right side began to tremor. I blanked out, causing my foot to slide from the gas pedal; and the car veered off the right side of the road. My mom grabbed the wheel and called my name to bring me back. She asked me what happened, but I could not tell her because I had no idea. Don’t worry, I have not gotten behind the wheel of a car since that day! I struggled but somehow managed to complete my sophomore year. My parents knew that if they didn’t get to the bottom of this, I would not return for my Junior year. By this point, sports were the last thing on my mind; all I wanted was to function normally. As the months ticked by, I was beginning to wonder if regaining neurological function was ever going to become reality. During this time my world was at a constant spin to the right. I couldn’t balance, couldn’t get my grounding. When I walked, my right leg would either drag or sway outward. My headaches were insane, on a scale of 1 out of 10, 10 being the worst, they were a 7 on a good day and a 10 on most days. I lost my sense of smell and taste; garlic had no odor to me. My tremors increased. Talking became really difficult for me, I was stuttering/slurring words, and it took me a while to form sentences; so whoever was communicating with me had to be extremely patient. Everything from the waist down was restless, I felt so uncomfortable in my skin. The right side of my body was weak and hard to control. Any movement left me nauseas and on the verge of vomiting. I had trouble falling asleep and never could stay asleep. I’d wake up in the middle of the night with cold sweats and my room spinning. I now felt myself slipping away! To best explain how the right side of my body felt, do you know how it feels when you are sick and feel super weak? Attempting to close your hand to make a fist takes all your energy, and you just can’t quite squeeze it tight. That is what it felt like losing function of my right arm and leg. I was unable to hold a glass and fill it up with water, unable to use a knife and fork, and unable to grasp a pen. Not because I lost strength in my muscles, but because my brain was no longer informing the right side of my body how to function. If you imagine a draw-bridge connecting the left side of your brain to control the right side of your body: my draw-bridge remained open. Therefore, information had to skip from one side to the other. Then when it landed, the message was mismatched, causing dysfunction within my body. My declining health had us seek another opinion with a neurologist. However, during our two visits with this doctor, we waited close to two hours to be seen each time, and he spent about 20 minutes with me and my parents. His curt and dismissive demeanor was sadly disappointing. The worst was the last visit. He evidently was in a hurry and rushed through the visit. Then as my mother was helping me walk down the hall to the elevator, he rushed right past us — never hesitated to help or even hold the elevator for us. In between the two visits, he referred me to speech, occupational and physical therapy. The only issue was after the evaluations my symptoms worsened. The lowest point of this journey came when the Speech therapist stated that in her six years of seeing patients, she had never seen someone who tested as poorly as I did; therefore, she concluded that I was exaggerating my symptoms. Hearing this was devastating. My parents immediately cancelled future appointments with her and attempted to explain that she didn’t have experience with my type of brain injury, and therefore they didn’t want her irresponsible statement to bring me down. Even though I knew my parents were protecting me, and that they had a point, this moment crushed me. To this day, it hurts to think about it. In the end, when the scans of my brain didn’t show the injury, this neurologist, during the rushed second visit, suggested I worked with a doctor to talk through my experience. The isolation and lack of answers left me frustrated and confused. My parents, felt strongly this was not something I was going to talk my way out of and were determined to find an answer; so they sought a third referral, this time with a Functional Neurologist, and thankfully this was the last referral. Simply scheduling the appointment at ChiroPro Performance, my mother knew this experience was going to be different. Mary, the coordinator, was so kind and patient as my mom desperately shared my story. The day came and although my parents were optimistic, I wasn’t. After ten months, I was deeply discouraged and felt completely hopeless. I walked in, prepared to wait the obligatory hour, and was pleasantly surprised when we were escorted into Dr. Carlson’s office on time. Dr. Carlson listened for the first 20 to 30 minutes, taking notes and not interrupting me; she understood my brain was injured and that I couldn’t communicate at a normal pace. My exam lasted close to two hours. This was the first time I spent more time with the neurologist than in their waiting room! During our next visit, Dr. Carlson thoroughly discussed the results of my exam. She used models, pictures and numerous handouts to not only explain, but to show us exactly what had happened and what continued to be going on inside my brain. This was extremely helpful, considering I couldn’t process information very clearly. She broke down the complexities of the brain and how the different parts of the brain intertwined with one another, as well as the multifaceted aspects of my brain injury based on the primary impact of the ball, as well as the secondary impact of hitting my head on the turf. For the first time in almost a year, my parents and I not only understood what had happened; but we had a peace come over us. We cancelled all other appointments and began an intensive rehabilitation program that focused on neurological, physical and metabolic recovery. That meant I was seen as often as two times per day, five days a week. It was, without a doubt, a burden for my entire family, but we didn’t care because we trusted Dr. Carlson and the team; and we were convinced they were going to help me. In addition to the therapy I received in the office, I had a home program as well, which was crucial to my progress. I had to remove all sugar, including the sugar in all carbs (that’s right no more bread, chips, coffee, cookies etc) because sugar is poison to a person recovering from a brain injury. Consuming sugar during my treatment would have been detrimental and directly impacted my progress. My diet became very high in protein (a minimum of 100 grams per day), along with fruits, vegetables, and lots and lots of water. Regaining brain functionality was the most challenging thing I have ever done; but this program is what changed everything for me. It is important to point out that no two brain injuries are alike. My program was specialized to the parts of my brain that were injured. I suffered an injury to the cerebellum, which controls movement, thoughts, emotions, learning and circulation. In addition, I dislodged the crystals in my ear canal which caused dizziness. My brain injury left me with dysautonomia, which is a condition of the Autonomic Nervous System. The Autonomic system controls the “automatic” functions of the body that we don’t consciously think about. For example: heart rate, blood pressure, pupils and body temperature control. This caused sensory mismatch within my body causing numerous secondary symptoms. While working on my rehabilitation; I was watched very closely to ensure I did not overstimulate my brain. Overstimulation leads to symptoms within my body: tremors, stuttering, and others that were easily seen. But in addition, overstimulation affected my blood pressure, heart rate and body temperature they could not be seen. For example, my right hand and arm would go cold while my left would get hot, or my heart would race as if I were running but I was only sitting in a chair, or when moving from one place to another I could get light headed to the point of feeling faint. Due to the dramatic fluctuation in my heart, I had to wear a heart monitor all day, everyday. The monitor allows me know how hard my heart is working; then I can slow down or stop until my body and brain can get acclimated. Luckily, I am improving and only wear it during physical activity now. There are no words to describe how grateful I am to the team at ChiroPro. Their passion, sacrifice, and patience towards me and my family just means the world to us. Right now I am focused on learning how to move my lower body without looking. For example, it is normal to walk down a hallway gazing ahead or talking with a friend. When I returned to school, I couldn’t do that; I needed to look at my feet to remind the brain signal how my body was to function. That is why I don’t transition classes when there are a lot of people in the hallway, and why I have to hold the railing going up and down stairs. My recovery is still playing out, but I am so appreciative for everything they have done for me. My experience has led me to talk to you today, so you get the help you need and learn how to safeguard your brain. Here are a few facts that I wanted to share because what remains difficult for me is explaining the injury and symptoms because they cannot be seen. It has helped tremendously is talking with others who have suffered brain injuries and knowing I am not alone. Fewer than 10% of sport related concussions involve loss of consciousness. The impact speed of a professional Boxer’s punch is equivalent to 20 mph. The impact speed of a stationary football player being hit is equivalent to 25 mph. The impact speed of a soccer ball being headed is equivalent to 70 mph. How did I get through the last 18 months? That is simple…FAITH! The F in Faith stands for Family. I could not have survived without my family, and I now extend the definition to friends who cared so much they became family. I watched my parents and sister make sacrifices as they adapted to caring for me 24 hrs a day; I couldn’t be left alone because I couldn’t care for myself. My injury changed the dynamics of our family, and oddly enough we are closer now having gone through this. Then once I was able to return to school, the Montrose family jumped in and helped. To my classmates and teachers, and especially Mrs. Elrod, Mrs. Whitlock and Mrs. Leist, I thank you for your patience. I would not have gotten through my Junior year without you. The A in Faith stands for Acceptance. Acceptance was necessary on many levels. It took me a long time to accept my injury and my circumstances. I was angry, actually very angry and that took a lot of my energy. As soon as I was able to accept this new journey, I was able to understand that along with the injury came a lot of opportunities to learn and grow. I want to be honest, some days I still struggle with accepting what happened– like when I want to do something my brain just can’t handle yet, I find myself disappointed and frustrated. But those days are not nearly as frequent as they used to be, which helps me remember I am getting better. The I in Faith stands for Intent. Intent is being determined to do something. Recovering from this required me to believe, without doubt, that every aspect of my rehabilitation had intention and that I needed to be fully committed. Intention became more important and more difficult returning to school than even rehab had been. I wanted to get back to school so badly, but it didn’t matter how much I wanted it; the only thing that matter was how much I was determined to do it. I am not the person I used to be, this injury has significantly changed me. As I continue to recover, my intention is now to not let this injury define me and to become a better version of my old self. The T in Faith stands for Time. When this happened, I was a fifteen year old girl who had been raised with the Internet, cell phone and social media, and patience was not something I was very good at. And remember, at that time my favorite aspect of school was playing sports and hanging out with my friends. Now, I am a seventeen year old girl who understands time is a gift; it’s how we choose to use it that really matters. The opportunity to learn and enhance our brains is truly a gift that we should not take for granted. Saying these words publicly blows my mind because 18 months ago I would have never thought like this. Missing that much school, on some days, may have seemed like the luckiest thing to ever happen; but, to be honest, it was devastating. Having the ability to read and write taken away from me, left me feeling like a toddler in a teenage body. I have a new-found respect for everything our brains are responsible for and capable of! I no longer take for granted the value of education, whether it’s the Pythagorean theorem or reading a Charles Dicken’s novel that contains a literary scheme in every other sentence. I am so grateful for the opportunity to get frustrated with learning a new concept. Lastly, the H in Faith is for Help. I found faith through the help of others. I was asked last September if I had a magic wand what would I wish for. My answer was to graduate with my class. But I am only here because of the service of so many who have assisted me in obtaining my goal. I still don’t know exactly why, but asking for and receiving help is difficult. The only thing I have come up with during this journey is to ask for help requires vulnerability. I used to see vulnerability as a weakness; now I understand it requires strength. I realize, l learned to love my brain only after being forced to. But, take it from me, you do not want to lose or decrease your brain’s ability in anyway. Obviously, if you or if someone you know has a concussion, tell a parent, teacher, coach or trainer. Do not feel pressured that you have to “tough it out.” And never ever think — “oh, it’s just a concussion” — because it is completely not worth the risk. Every brain is different so everyone’s rehab and recovery time is different.You are the only one who truly knows how you feel inside. In addition, think about how often you rest your brain. We only get one brain; it’s not like an iPhone where if we drop and damage the screen you can get it replaced. Our brains allow us to function and perform daily activities we take for granted: walk, talk, read, write, sleep, eat, digest food, and the list goes on. These are things I no longer take for granted. The brain is the most complex organ in our bodies. Our brains help us to perceive the world around us. But, when something damages it, it can affect our whole body. Do not take it for granted! I stand here alone, but I know I didn’t get here alone. To everyone who helped me get to this stage, thank you!